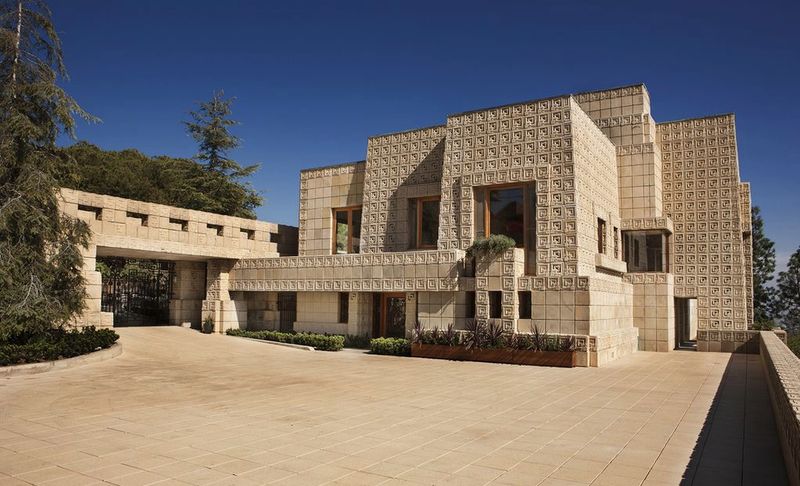 One of Frank Lloyd Wright’s most famous mansions, known as the Ennis House, is up for sale in east Los Angeles in the US state of California. And even if you don’t know the house, you certainly know the movies that the famous building has appeared in, including Blade Runner (1982), The House on Haunted Hill (1959) and The Replacement Killers (1998). The 6,000 square foot house can be yours for the low price of just $23 million (£17 million). Finished in 1924 and drawing inspiration from ancient Mayan temples, the house was built for Charles and Mabel Ennis, owners of a men’s clothing store. The house was sold to radio announcer John Nesbitt in 1940 and had roughly eight different owners through the rest of the century. The house’s unique appearance has made it a favourite for filmmakers in Hollywood, first appearing on screen in the 1933 film Female. Fans of the 1982 sci-fi classic Blade Runner will recognise the house as Rick Deckard’s flat, a dark and moody place. The film, directed by Ridley Scott, used the spacious interiors in a strangely claustrophobic way. As K.R. McNamara explains in the 1997 paper, “Blade Runner’s Post-Individual Workspace,” the Mayan design of the house is used ingeniously in the futuristic movie to blend with the “pyramid-style skyscrapers” of the film to “suggest that the city is a collective memoir of the thirties turn-of-the-millennium city.” Which is to say that Blade Runner’s visual style succeeds by drawing from the ancient to create a new future. Black Rain (1989), another neo-noir directed by Ridley Scott, used the Ennis House’s interiors as a building in Osaka, Japan. Again, the desire was to create something mysterious and almost other worldly about the atmosphere. The 1959 horror movie House on Haunted Hill, starring Vincent Price, also used the house’s weird allure to full effect, though that film only used the Ennis House’s exteriors. The interiors for the classic William Castle-directed shocker were shot on a set, but you can feel the creepy 1920s vibe throughout. Viewers can tell there’s something not quite right about this house from the opening shots. And the house’s history isn’t just gloom and doom. The 2003 documentary Los Angeles Plays Itself points out that the house has also been popular in music videos from the 1980s and 90s. The music video for 3T’s song “Why” featuring Michael Jackson utilised the house, along with other videos from people like Ricky Martin. As Variety notes, the house was badly damaged in the 1994 Los Angeles earthquake and became terribly neglected until it was purchased in 2011 by billionaire Ron Burkle. The house has since been recognised both locally and nationally as a historic site and restored to its former glory. The house is on the US National Register of Historical Places and when people can’t shoot their movie or TV show in the real thing, they’ll often copy its style, as you might see in shows like Game of Thrones.